Vancouver, British Columbia--(Newsfile Corp. - May 29, 2018) - Zinc One Resources Inc. (TSXV: Z) (OTC Pink: ZZZOF) (FSE: RH33) ("Zinc One" or the "Company") is pleased to announce additional results from its drill program at the southern area of the Mina Grande Sur zone, part of the Bongará Zinc Mine project located in north-central Peru. Drilling in this area of Mina Grande Sur has been focused on the delineation of near-surface, high-grade mineralization. To date, results from 50 drill holes for a total of 803.6 metres at Mina Grande Sur have been reported with results from the 45 remaining holes to follow upon receipt. The drill program at Mina Grande Sur has now been completed and included a total of 2,328.4 metres from 95 holes (see map below in Figure 1.). Results of the drill program will contribute to the overall understanding of the area and provide data in support of the upcoming technical report expected to be released in Q3 2018. Jim Walchuck, President and CEO of Zinc One commented, "These results from the completed drill program at Mina Grande Sur continue to demonstrate that the Bongará Zinc Mine project is an exceptional zinc-rich deposit. We fully expect that the data collected from Mina Grande Sur will become part of the upcoming resource calculation for the entire project. While we wait for the remaining results from Mina Grande Sur, the drill program will be focused on the Mina Grande Centro zone, where drilling has now commenced, and then continue in the Mina Grande Norte zone." Results from 24 holes were reported previously (see news releases from March 29, 2018 and May 7, 2018). 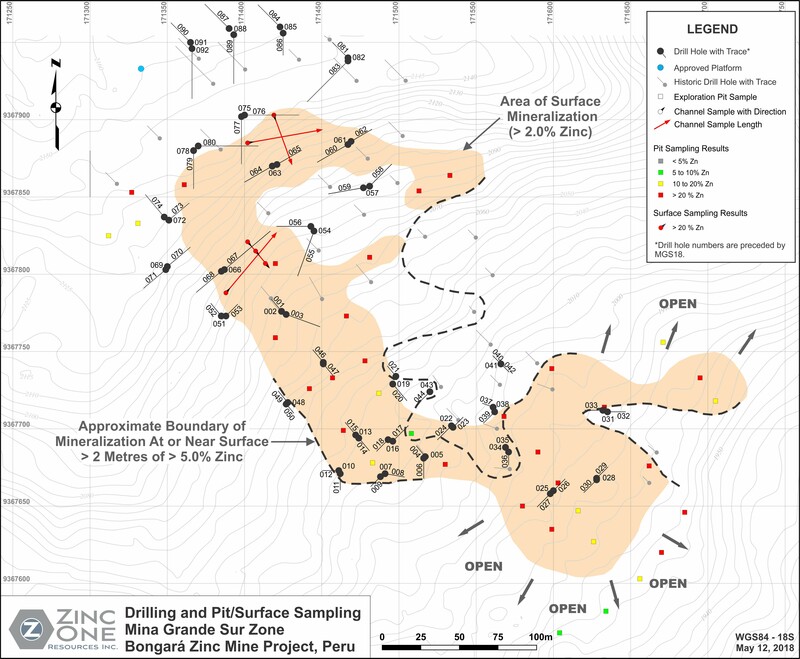 Mina Grande Sur is one of three known zones of high-grade, near-surface zinc-oxide mineralization along a 1.4 kilometre mineralized trend that is being tested by this drill program. Results from the 36 holes drilled have been reported at Bongarita, which lies approximately 1.3 kilometres northwest of Mina Grande Sur. A significant high-grade zinc deposit was discovered during the drill program at Mina Chica, which is approximately 1.2 kilometres northwest of Mina Grande Sur. Results from 35 of 53 holes drilled at Mina Chica, for a total of 2,370.9 metres, have been reported to date. The sample from each core run is placed in a 60-centimetre long, plastic core box that has five columns. Core recovery, rock quality designation ("RQD"), and geologic features are logged and sample intervals, which are generally <2 metres, are chosen. Each core box is photographed and then sampled with a spatula (soil and heavily-weathered rock) or cut with a core saw, 50% of which is placed in a sample bag and stored on site in a secure location. The Company independently inserts certified control standards, blanks, and duplicates, all of which comprise at least 20% of the sample batch, to monitor sample preparation and analytical quality. The samples are stored in a secure area until such time they are shipped to the CERTIMIN laboratory in Lima (ISO 9001 Certified) for preparation and assay. At the laboratory, samples are dried, crushed, pulverized and then a four-acid digestion is applied. This is followed by the ICP-AES analytical technique for 33 elements, including lead. The same method is used to assay zinc for values up to 20%. If zinc exceeds 20%, it is then analyzed using a titration method. The laboratory also inserts blanks and standards as well as including duplicate analyses. Zinc One is focused on the exploration and development of prospective and advanced zinc projects in mining-friendly jurisdictions. Zinc One's key assets are the Bongará Zinc Mine Project and the Charlotte Bongará Zinc Project in north-central Peru. The Bongará Zinc Mine Project was in production from 2007 to 2008, but was closed due to the global financial crisis and concurrent decrease in the zinc price. Past production included 20% zinc grades and recoveries over 90% from surface and near-surface zinc-oxide mineralization. High-grade, zinc-oxide mineralization is known to outcrop between the mined area and the Charlotte Bongará Project, which is nearly six kilometres to the NNW and where past drilling intercepted various near-surface zones with high-grade zinc. Zinc One is managed by a proven team of geologists and engineers who have previously constructed and operated successful mining operations.